Generally younger people suffering with arthritis. 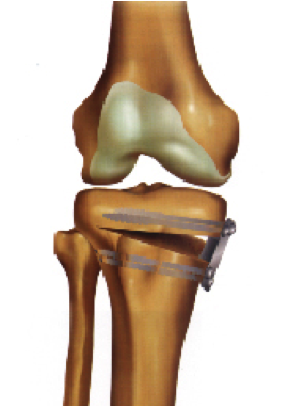 Osteotomy around the knee is an operation to alter the alignment of the leg. It is mainly used in the treatment of arthritis in young patients to avoid knee replacement but also has a role in the treatment of complex knee instability. This operation is aimed at realigning the leg so as to reduce the forces of body weight that go through the inside (medial aspect) of the knee that has and transfer them more to the undamaged normal outside (lateral) compartment of the knee. The operation is particularly suited for young and very active patients who wish to avoid artificial joint replacement and who have a normal lateral compartment of their knee without any significant wear and tear arthritis. Most patients get good pain relief from an osteotomy although often the pain is relieved rather than abolished. The benefit is that it allows a much higher level of functioning. Activities of daily living are usually much less painful. However, as the knee arthritis still exists it can still hurt, particularly if overloaded with a lot of impact activities. One role of an osteotomy is to avoid/delay the need for a total knee replacement and thus hopefully avoid the situation where a second Total Knee Replacement (TKR) is required. The major advantage of an osteotomy over joint replacement is that you still have a natural knee, no bridges have been burnt; you have fewer restrictions than after a knee replacement, without any specific restrictions, including running. If the knee deteriorates and the wear and the osteoarthritis progresses then it is possible to have a Knee Replacement. Instability or severe pain of the knee. Most problems are diagnosed clinically on the basis of the knowledge of symptoms and the findings on clinical examination. X-rays and MRI scans can help to confirm the diagnosis and the severity of the condition. Physiotherapy exercises aimed at strengthening and improving the coordination may be used but are likely to have limited effect. The only corrective solution is to have surgery. This involves cutting the tibia (osteotomy) and either removing a wedge of bone (closing wedge) or opening the osteotomy (opening wedge) and filling it with a wedge of bone or bone like substance. This allows correction of the angle of the lower leg at the knee. In effect, the tibia is therefore fractured and this “fracture” is stabilised with a staple or plate. The surgery is performed under General Anaesthesia, taking 30-60 minutes and usually requires an overnight stay in hospital. In addition to the arthroscopic surgery incision there is a longer incision on the inside or outside of the calf depending on the type of osteotomy. Patients are unable to drive for 6 to 8 weeks following surgery. As the operation effectively creates a fracture of the tibia it requires about 3 months to heal and so the recovery time takes this long until most patients feel themselves to be ‘recovered from surgery’. This will involve an overnight stay in hospital. All patients will need someone to take them home and be with them on the night following surgery. The anaesthetic will wear off after approximately 6 hours. Simple analgesia (pain killers) usually controls the pain and should be started before the anaesthetic has worn off. Post-operatively, the knee is immobilised in a splint that keeps the knee straight. This is ‘weaned’ off by 6 weeks post-operatively. No weight-bearing is allowed in the first few weeks following surgery and crutches are required for a minimum of 6 weeks and most patients are fully off crutches by 8 weeks following surgery. The large bandage around the knee is normally removed 24-48 hours after surgery and a tubigrip to supply gentle compression to reduce post-operative swelling. The non-stick sterile dressings on the wounds are replaced with clean waterproof dressings. The wounds should be kept clean and dry until the wound has sealed. Showering is fine and the waterproof dressings can be changed afterwards. Bathing is best avoided until the wounds are sealed, typically 10 days after surgery. In summary, whilst the wounds are wet - keep them dry and when the wounds are dry, you can get them wet! Surgery is followed by a prolonged course of physiotherapy. This requires a commitment to undertake this rehabilitation in order to achieve the best possible result (at least half an hour per day for 6 months). It is vitally important to stay within the post-operative activity restrictions an physiotherapy guidelines to avoid damaging stretching your reconstructed ligament. When you can walk without crutches or a limp and be in control of your vehicle (about 4-6 weeks). There is significant improvement in pain ( ie reduced by approximately 80%) in approximately 90% of patients. It takes almost a year for the effect of the surgery to reach the maximal benefit. This benefit last for more than 10 years in the majority of patients. If pain recurs, a knee replacement might be necessary. An Osteotomy is a routine operation but no operation is without risk. Infection Deep bony infection is very rare (<1%) but if it occurred and was untreated then serious problems could occur. Many other complications are possible, most of which are treatable but in general the risk of sustaining a complication that leaves a patient significantly worse off in the long term is around 2%. All these risks are uncommon and in total, the chance of you or your knee being worse off in the long term is about or less than 1%. Thanks Mr Gibbon for giving me back my quality of life; after my arthroscopy I can now dance and play sport again. KM age 15. I take my hat off to the the surgeon, Dr Gibbon, and the theatre staff were lovely - the nurses and care assistants as well. Thank you for all the hard work from the start and finish. You should be proud of the care you provide. I had a very pleasant stay in the York Nuffield and the team that looked after me were brilliant; Mr Gibbon, Rami, Wendy, Joanne, thank you to you all. Following a 26 mile inca trail, we arrived at Machu Picchu today - 5 months postoperative Revision Total Knee Replacement. A big thank you !!!! To say that my day surgery at Clifton Park was positive experience is an understatement. The care I received far exceeded my expectations. I was treated in a kind and friendly manner by all those involved in my operation. Mr A.J. Gibbon was very good and skilful; he explained everything at each stage. I was amazed that I had no pain or discomfort while I was in hospital and since leaving I had only experienced the mildest discomfort. Thank you so very much, I am confident that my rapid recovery is due to your skill and expertise as a surgeon.